For the next few weeks here on Site of the Week, we'll be featuring some of the sites that you'll see on our sixth annual calendar - and to kick it off, we start with "Miss December 2007," a site very close to home. 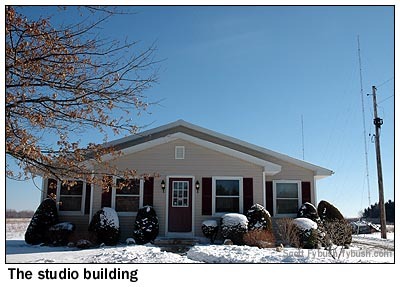 This is WCJW 1140, Warsaw, New York, the only AM station in Wyoming County, halfway between (and a bit south of) Buffalo and Rochester. 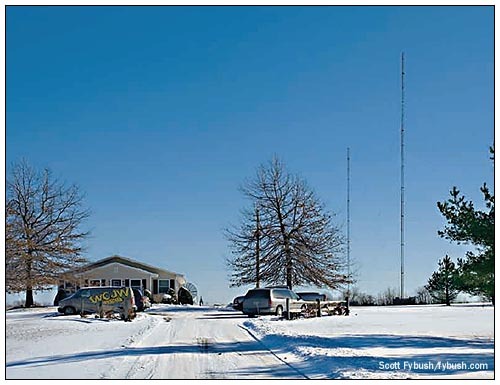 Weeks built a small studio and two towers on a hill just east of the village of Warsaw (a hill so steep, by the way, that truckers heading west on US 20A must pull off the road and read a warning sign that reads, in effect, "TURN AROUND" before being sent on an alternate route into town), and signed the station on with an easy listening/MOR format. It's only about an hour from NERW Central down to Warsaw, but for some reason your editor had never made the short trip to see the inside of WCJW until a sunny morning in January 2005, when Mark Humphrey, the Philadelphia-based engineer who happens to have been Lloyd's college roommate, was up for one of his periodic trips to help Lloyd at the station and invited me down. The building is simple and logically laid-out - there's a lobby in front, then a corridor with a sales office leading back to the studios. Visitors who've made it this far back into the building have by now been greeted by WCJW's security staff. 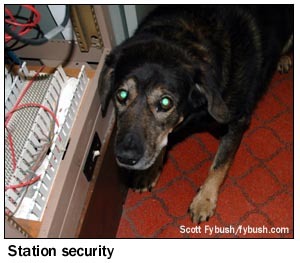 That's "Hartz The Wonder Dog," and he has his very own page on WCJW's website! 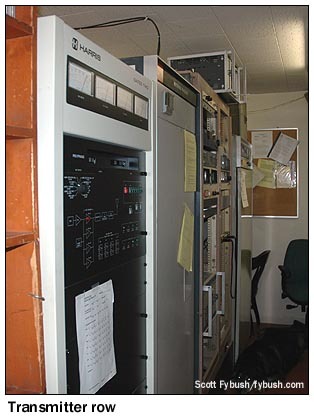 He's posing for us next to WCJW's transmitters, which are all the way at the end of the corridor, past Lloyd's corner office and the main studio (which looks right into the transmitter room, in that great tradition of small AM stations). 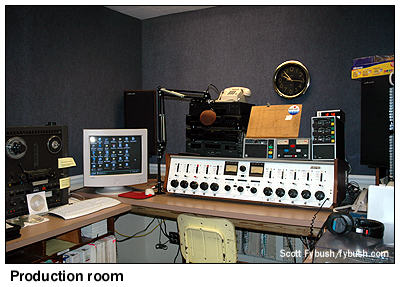 The Harris Gates Two transmitter came in a few years ago, when WCJW won a power increase to 2500 watts, still daytime-only (which won't change as long as WRVA in Richmond is on the air.) Next to the Harris is an ITA phasor that came out of WIZR in Johnstown, and back in the corner is the Gates BC-1H that was bought new when the station signed on. 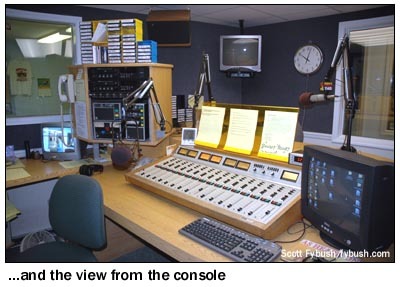 Mark reports that the station's original processor was a Gates "Solid Statesman" limiter that had once been used at WABC; it was later replaced with a Dorrough DAP and eventually with the Optimod that's now in use there. And that - save for the microphone collection in Lloyd's office - is pretty much it. 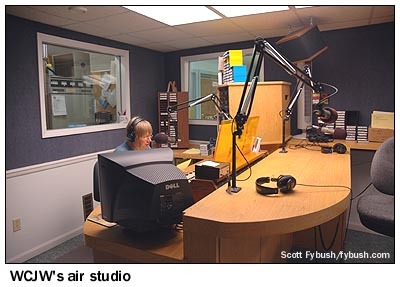 In a county with no daily newspaper of its own, and no other locally-operated station (WLKK is operated out of Buffalo, as is Catholic WLOF 101.7 Attica, and WCOU 88.3 Warsaw is operated by Family Life Network out of Bath), it's great to see a local radio station being, well, local. Thanks to Mark Humphrey and Lloyd Lane for the tour!